Ugly Kitchen Flooring In Your Rental? Found an amazing apartment with awful kitchen flooring? With these rental-friendly flooring tips, you can give your apartment a mini-makeover and take your kitchen flooring from drab to dreamy in no time. You may have faced this apartment rental hunt crisis: You’ve found the perfect apartment at the perfect price, only it has the most imperfect kitchen flooring. The floors may be unbelievably ugly, or extremely uncomfortable, or incredibly busted looking — or even all three — and one thing is clear: They’ve got to go. The good news is that there are a few ways that you can change your kitchen floors when you live in a rental. Some of them are temporary, some are more permanent, and all of them are beautiful. Check out your choices below. 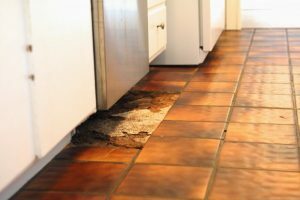 One way to change your ugly kitchen floor is to ask the landlord to share in the expense of upgrading it — especially if the kitchen floor may be the one thing detracting from an otherwise beautiful apartment. One way to do this is to offer to purchase the flooring material of your choice, like distressed heart pine or darkly stained bamboo. Your landlord could then pay to have it installed. Many landlords are totally open to doing this, since the new floor helps increase the value of the apartment. If your landlord doesn’t want to install it but gives you permission, consider whether or not the expense will be worth your happiness. Some people will say that it’s not worth it upgrading someone else’s property, but if it will make you deliriously happy and you can afford it, do it. If you’re new to the idea of temporary, floating floors, you’ll think back to all the ugly flooring that you suffered through over the years and wonder how you lived through it. Floating kitchen flooring is usually laminate or vinyl flooring that’s been fashioned to look like more expensive flooring options, including materials like wood or marble. The flooring, available from companies like Xterior Plus, is usually sold as planks or tiles and is pretty easy to install. The floors can be installed — or “floated” — over most types of existing flooring. The best part is that this flooring can be removed at the end of your lease, usually by simply lifting it up and tossing it away! Go crazy with everything from cork to faux hardwood. Peel-and-stick? You probably assume that something that shares a name with kids’ sticker books would never look good in a real house, in a real kitchen, but peel and stick can actually greatly improve the look of ugly kitchen flooring. From traditional wood looks to Moroccan mosaic tiles to vintage ’50s checkerboard patterns, you can change the look of your floor in an instant for very little money. This is probably the most cost-effective temporary floor option and, if installed properly and chosen wisely, should last you the length of your lease. With these rental-friendly flooring tips, you can give your apartment a makeover and take your kitchen flooring from drab to dreamy in no time.